Warning: Don't read this entry on an empty stomach! The first time I had authentic chicken mole with its tantalizing, spicy chocolate sauce was at the Mexican pavilion at Epcot Center in Florida soon after the entertainment complex was built in the early 1980s. Oh, my! I was a convert, and started ordering similar dishes in "real" Mexican restaurants after returning home to Atlanta, where I lived at the time. It's been several years since I've savored the spicy sauce in an entree. 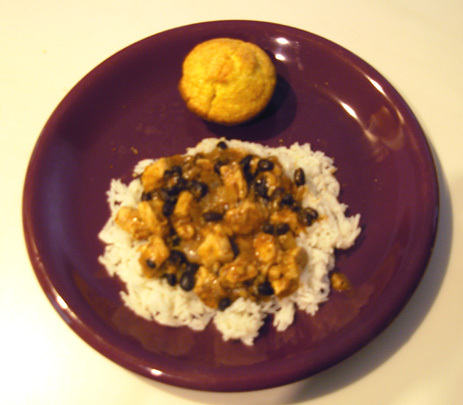 When I discovered a recipe for a chicken dish with mole in a local publication on our recent trip to Phoenix, we purchased the ingredients and prepared it in the camper -- it's that easy! I'll include the recipe at the end. Jim and I don't eat at restaurants very often, either at home or when we're traveling in our camper. There are several reasons. At home, we're a long way from town and the restaurants we like. We enjoy cooking together and it's easier to control quality and calories when we do our own food preparation. Plus, it saves a lot of money. When we're traveling we also do most of our own cooking. We can carry a fair amount of food in the camper's refrigerator, freezer, cupboards, and pantry. We usually carry TOO much with us on trips (the extra weight doesn't help our pitiful gas mileage), but I'd rather stock up on staples at home and just pick up perishables when we need them along the way. Occasionally, however, it's fun to find local ethnic restaurants with tasty, healthy food when we're traveling. 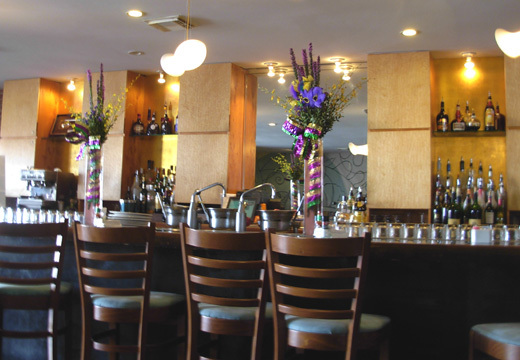 We like to focus our search on regional specialties -- like Mexican food in the Southwest, seafood on either coast or the Gulf, Asian restaurants on the Pacific Rim, that sort of thing. We usually "do" lunch because menu items are typically less expensive than at dinner time. Here is my very personal take on the restaurants we visited on our recent Southwestern trip. YMMV: your mileage (opinion) may vary! The first time we visited the Mesa YMCA (Phoenix area) it was late morning. We asked a couple of the staff members if they could recommend a good Mexican place for lunch. We were willing to drive several miles, if necessary, to find quality ingredients, low-fat cooking, and good flavor. To our surprise they both enthusiastically recommended a Mexican restaurant named Rosa's only one block away at University and N. Mesa. How convenient is that? Wow -- wonderful, authentic Mexican food that met all of our criteria! It's not the cheapest place in the world, but the quality is excellent and we highly recommend it. We went two times for lunch. The first day I had a tasty combination with spinach enchiladas, black beans, and a corn medley. Jim also enjoyed his chicken enchiladas with refried beans and rice. The next time he had the spinach enchiladas and I had the biggest salad I've ever seen -- lots of grilled and marinated pieces of chicken breast served on a large bed of spinach and assorted greens with red bell peppers, onions, mango strips, and croutons. It was so big Jim had to help me finish it. Hey -- I had to save some room for the large chocolate frozen yogurt from Costco that we had for dessert!! 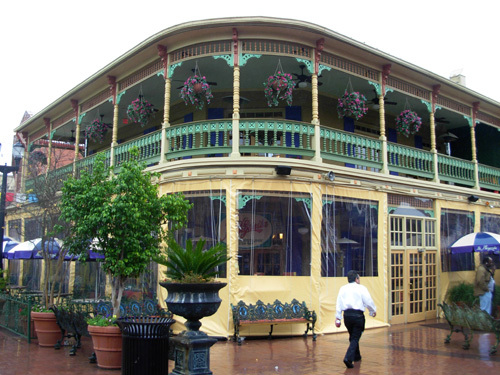 La Margarita Restaurant and Oyster Bar is located in the historic Market Square area along Produce Row. It was a chilly, misty day so we ate inside the colorful restaurant. Although it was busy at lunch on Friday, we didn't have to wait for a seat and our waiter was attentive and prompt. We both chose our waiter's recommendation of one of the daily specials. We started off with tortilla chips, spicy salsa, and a tasty bean soup for appetizers. The good-sized entree was tender pulled pork, rice, sautéed vegetables, guacamole, and hot tortillas. The price was right for all that food -- only $5.95 each! It was good, but not as good as Rosa's in Mesa. (But then, Rosa's was $9 or $10 for the lunch entrees we had.) 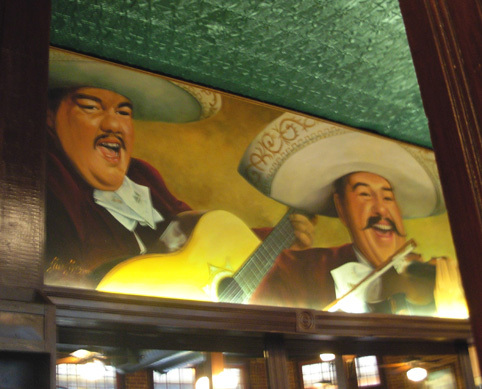 And we even had two singing mariachis during lunch, perhaps the ones in the first photo above? 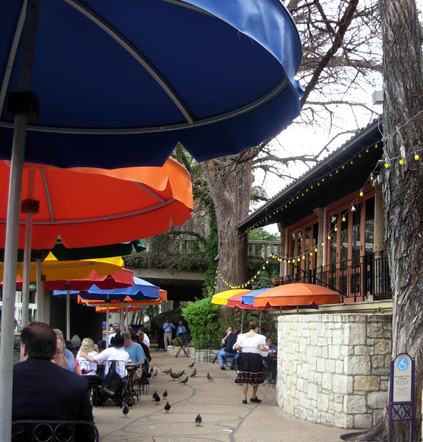 When we toured the fabulous Riverwalk we had lunch right along the river (I mean, RIGHT along the river!) at Casa Rio Mexican Restaurant, the first restaurant in the area with riverside dining and gondola rides (they don't have the gondolas any more). laughing at the antics of the ducks across the water, marveling at the brilliance of the idea to create this beautiful concept downtown. 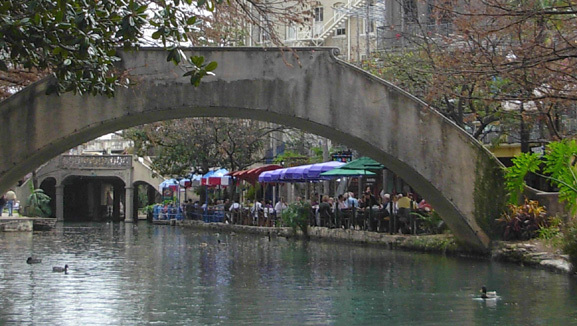 There are lots more photos of Riverwalk in the January 28 entry. Our food was only so-so at Casa Rio, however -- our least favorite of any of the restaurants mentioned here. Our serendipitous choice for lunch in Galveston was right on the mark. We were on a Gulf island and we wanted fresh local seafood. I don't know if any of it was local (forgot to ask! ), but it was definitely fresh and delicious. We were both happy with our choices from the Saltwater Grill, located across the street from the 1984 Opera House in the Strand Historic District. Jim had Little Daddy's Gumbo for $7.99. I don't think he'd have room for BIG Daddy's Gumbo, which was twice as big for $14.99. This is a dark roux seafood stew with a generous helping of shrimp, oysters, and crab. It was filling. My choice (bouillabaisse) cost $3.00 more but I got more food! This is a Cajun/French-style stew with shrimp, snow crab,, clams, mussels, and some kind of white fish in a delicious saffron-flavored broth. It was much lighter fare than Jim's dish. I was pleasantly full, but not stuffed. I like to pick up free local papers and magazines when we visit a new town or city. "Alternative" sources of information like this can be quite enlightening. In one Phoenix publication I zeroed in on an easy recipe for Chicken Chili Mole and bought the ingredients we didn't have on our next foray to Wal-Mart and Costco. It is great with rice, beans, a salad, and corn bread or muffins. Not only was this recipe absolutely delicious (lots of herbs, spices, dark beer, jalapeno pepper, cheese, and unsweetened chocolate -- how can it NOT taste good??) but we also discovered in the article that Costco carries one of the most wonderful varieties of cheese we've ever tasted: Chipotle Cheddar. We used it in the chicken mole recipe and found many other ways to enjoy it: sliced and eaten alone or with crackers; melted in grilled cheese sandwiches or tuna-noodle casserole; grated on salads, fried eggs, regular chili, burritos, etc. It really adds a zesty flavor without overwhelming your taste buds or sinuses. We bought a second big chunk of the cheese before leaving Phoenix but it was gone by the time we got to San Antonio. This is another city close to Mexico, so I didn't think there would be any trouble finding chipolte cheddar at the Costco we visited there. Wrong! They don't carry it. We didn't go to a Costco when we buzzed through Houston, so don't know if they have it there. Something told me that Costco probably wouldn't carry it outside the Southwest, but I was surprised about San Antonio. I haven't had time to investigate the ethnic grocery stores or specialty food markets in the Roanoke area yet (we don't have a Costco within a two-hour drive). At least we can get it from the source if we start craving it before our next trip to Phoenix: www.bravofarms.com. Heat olive oil in deep, large skillet and cook onion with garlic, thyme, oregano, and whichever hot pepper seasoning(s) you're using -- cayenne or chipolte powder, or minced fresh Anaheim or jalapeño -- until onion is just browning. Set aside onion mixture. Add chicken to skillet and sauté until no longer pink; return onion and add broth, beer, and tomato paste. Bring to a boil and season with cinnamon (or allspice) and salt. Simmer 10 minutes. Mmmm. Think I'll go mix up a new batch for supper . . .